Residents across the whole borough were flooded out, as water and sewage spilled from Thames Waters’ main trunk pipes and into people’s homes. Clearly, many of the problems are in line with what is happening across the country as a result of record rainfalls. 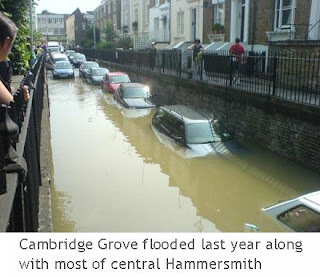 However, these are the fourth set of floods that the borough has experienced in three years, which raises questions about whether Thames Water and the Council have taken sufficient precautions to limit the damage. There are three issues here: Firstly, each property should have a Non-Return Valve at the junction where the property’s pipes connect with Thames Waters’ sewers underground. This valve is crucial as it is designed to stop sewage and foul water flowing from the sewer and into people’s properties via their own plumbing system. Access to these valves is limited to Thames Water's representatives as they are situated in their sewers. However, many of the Non-Return Valves have fallen away over time which is why large numbers of residents have had foul water flushed into their homes. Secondly, the main trunk sewer pipes are 1.2 meters in diameter, with connecting sewer pipes (serving most residential roads) being smaller. These can and do become blocked. For example, Thames Water themselves told me that the floods in Askew Road, eighteen months ago, had occurred because a large real of rope had got into the system and blocked up the main sewer serving that area. Finally, the local Council has a responsibility to design out problems in its road architecture as well as to maintain gullies and keep them clean so that road water can flow into them. The Conservative Administration has reduced expenditure on refuse, street and gully cleaning by £1.5million and it’s cutting funding to highways. 1. How many properties currently have working Non-Return Valves? 2. When were the valves last surveyed? 3. How often are they maintained? 4. How often are the sewers surveyed, cleaned and maintained? We believe that Thames Water must address these issues as a matter of urgency. They make around £180million net-profit per annum yet have only spent £90million upgrading sewers and providing additional storage for floodwater in the last few years. Meanwhile, I understand that the Council switchboard was swamped with calls from people requiring help last week. H&F Council’s position is that people should address their problems for themselves via their insurance companies and stay with friends or family if necessary. My colleagues and I are keen to ensure that the Council is taking all possible measures to limit present and future problems and will be calling for an enquiry into the matter. I'll keep you updated as to how we do.